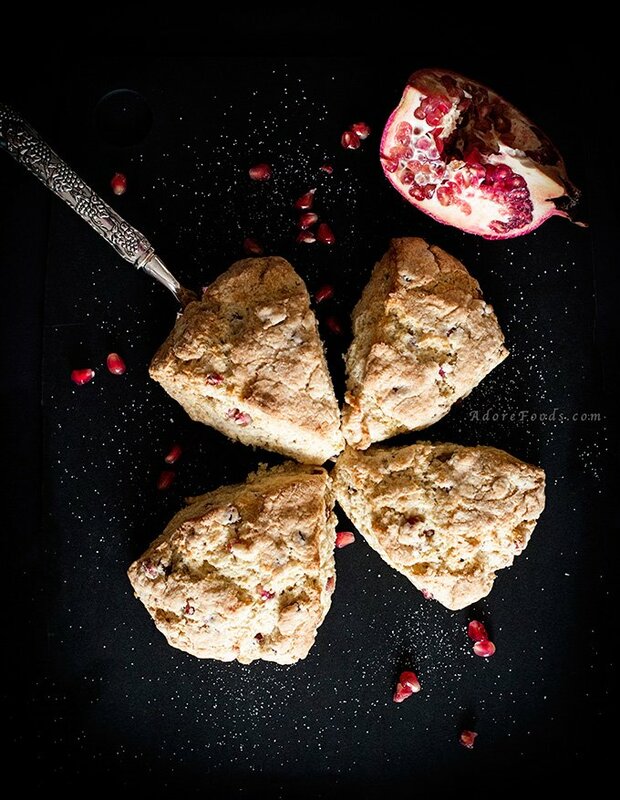 I made Pomegranate Citrus Scones, a surprisingly delicious accident! They were supposed to be blueberry scones in the first place but someone ate all my blueberries over night. This morning had everything planned and surprise! no more blueberries. 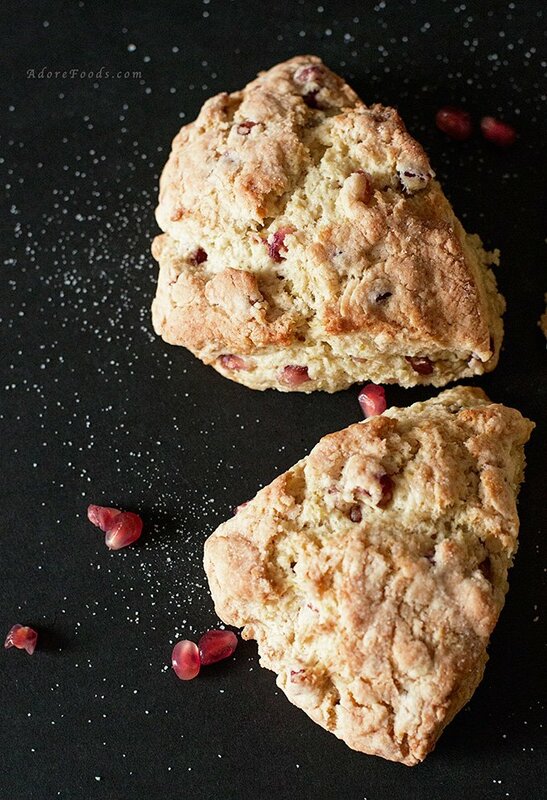 Going quickly through my options I realized I only had pomegranate to consider adding to my scones. 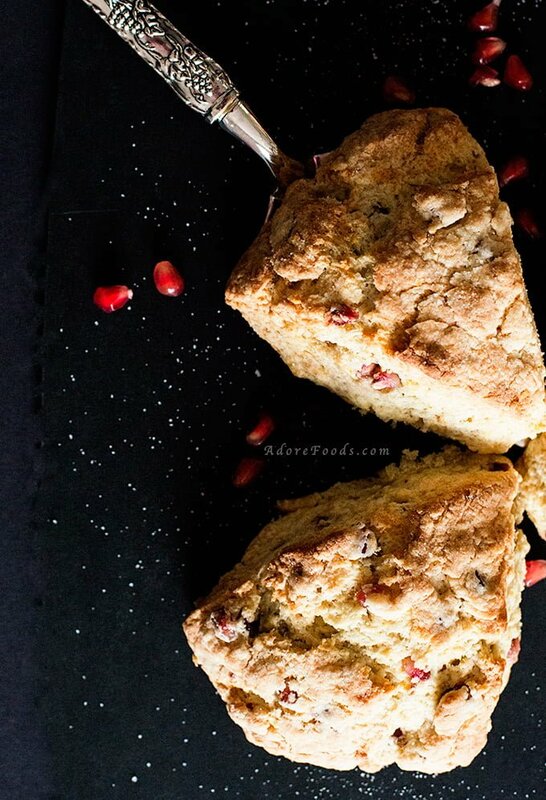 Now, pomegranate scones? Quite weird combination, you have to agree. To make it even stranger I have decided to add some orange zest in the mix, just to be a little bit more sure that there will be enough flavor. I am not going to say I knew what I was doing. I was not even sure I will have anything worth to post today. 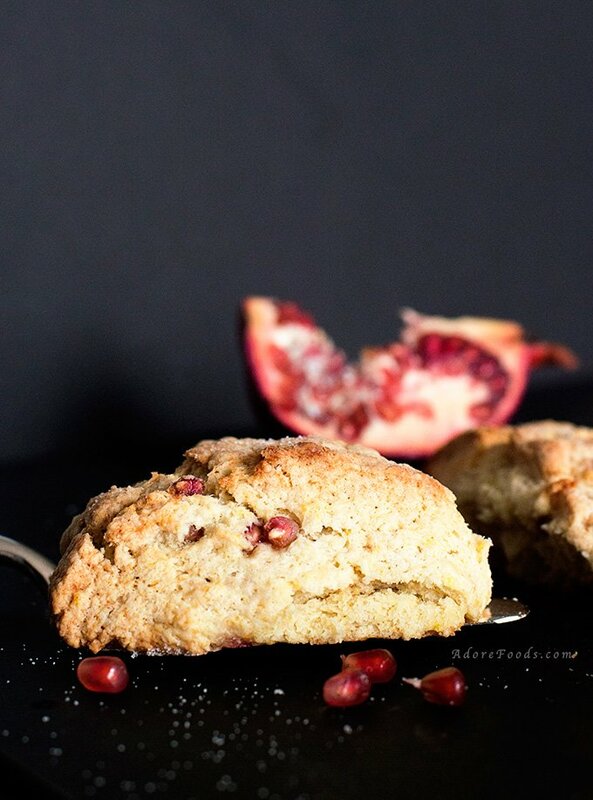 So, what is the secret to bake a perfect scone? As this article mentions the most important part when making scones is not to overwork the dough. We usually have a natural tendency to work the dough, just to be sure everything is well incorporated. Well, don’t! Try and handle the dough as little as possible. 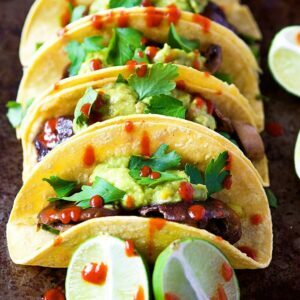 You have to give them a try! 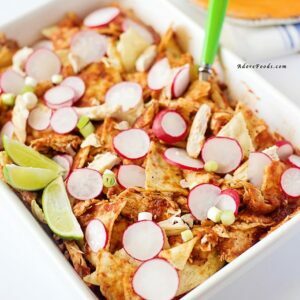 In a large bowl, combine dry ingredients: flour, sugar, baking soda, baking powder and add a pinch of salt. Add butter, grating it into the dry mixture on a large holes grater. 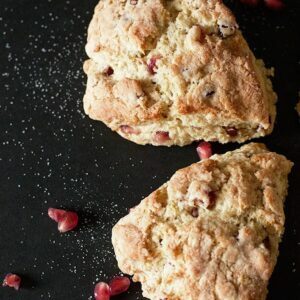 The colder the butter is (you can even put it in the freezer for sometime before making these scones) the easier to have it grated. Rub butter by hand into the flour mixture to get a fine crumb texture. 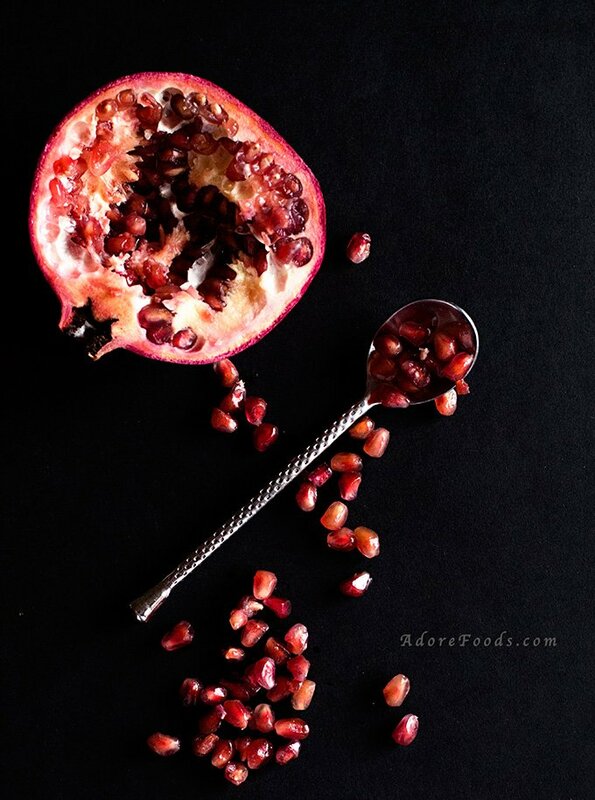 Stir in pomegranate seeds and orange zest. In a small bowl, whisk together the cream and the large egg until smooth. Add cream and egg mixture to large bowl and combine the ingredients gently, mixing them together to form a dough. Remember not to overwork the dough. Tip the dough onto a slightly floured surface and using your hands bring it together in a thick, neat round. Using a floured knife cut the dough into 4 or 8 triangles, depending on how big is your round. Place scones on a lined baking tray, leaving a little bit of space between them. Sprinkle some sugar over the top and bake them on the middle oven rack for 15-20 minutes, or until golden. 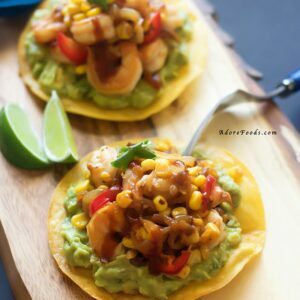 Allow to cool for a couple of minutes and serve them warm or at room temperature. Hi Maude! 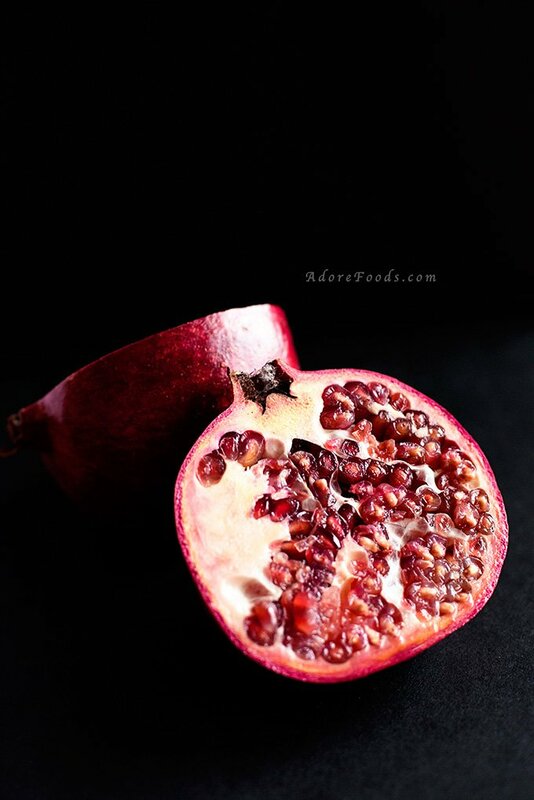 I had a large pomegranate and was more than enough. Hope you’ll love them!